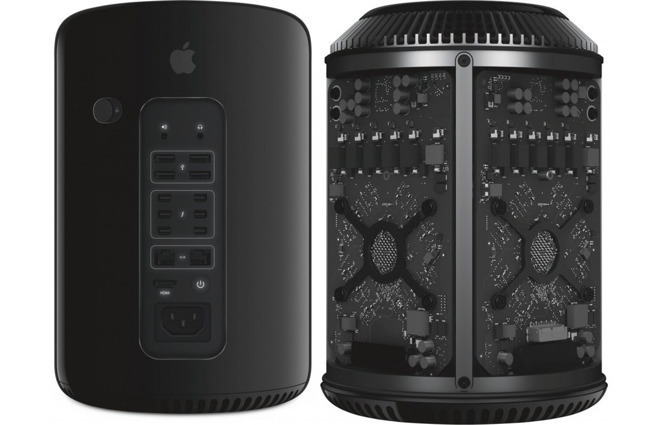 Apple's cylindrical Mac Pro from 2013. The standard supports bandwidth up to 128 gigabytes per second, and clock speeds up to 32 gigahertz, PCI-SIG says. That's twice the performance of PCIe 4.0, but since 4.0 was only launched in 2017, the organization expects both standards to remain around for some time. PCIe 5.0 will be backwards-compatible with earlier hardware. A final specification is due to be ratified later in the first calendar quarter of 2019. Manufacturers frequently begin design work well before that point though, making it probable that the first PCIe 5.0 products will ship to end-users at some point in mid-2019. The cost of stepping up to PCIe 5.0 may make its first adopters businesses like data centers, researchers, render farms, and high-end "server-grade" equipment. Many desktops and laptops will hold on to PCIe 3.0 and 4.0 for the foreseeable future. The 2019 Mac Pro is slated to be "modular" but what that term means at present isn't exactly clear. PCIe encompasses more than just expansion slots, but offering PCIe 5.0 slots out of the box would help future-proof the computer, and potentially prove to the professional community that it's serious about meeting its needs. Apple is also sometimes a vanguard of new connection technologies, being an early backer of USB, FireWire, and Thunderbolt. Less likely is PCIe 5.0 showing up in other Macs such as the iMac 4K or iMac 5K lines any time soon -- and expansion slots for the pair certainly won't materialize. The company is already under fire for the growing cost of its products, which is hurting profits in markets like China. Uh, PCIe 4 has barely made it out into systems and Apple’s 2019 Mac Pro will have PCIe 5? Why? Hardly anything will be available for it. They can wait until 2022 to support PCIe 5. There isn't any IP for PCI-E 5.0 yet, so the chance of it coming up in this year Mac Pro is Zero. The old Mac Pro only supported PCIe 2.0 and we find PCIe 3.0 graphics cards now available, so if Apple only supported 3.0, most people would be fine with that, so the older 4.0 standard would be still ahead of the pack. "The company is already under fire for the growing cost of its products"
In the case of the mac, is it as much the inflexibility of options? Onboard T2 drives, narrow spec'd RAM and touchbars may be very compelling options for many, yet for others can this discourage core upgrades like CPU/GPU where these 'extras' are only available with such...? 128GB/s is just insane, but for pros, I'd bet they would have a use for it. Would be interesting to see how fast the rest of the industry adopts it. If Apple includes it in the new Mac Pro, I would think some of the main vendors like AMD and Invidia would have upgrade options for the PCI 5.0 spec in the pipeline... presuming the Mac Pro is as modular as the folks say it is. i doubt PCIe 5.0 would be in any factory machine soon, let alone slowly updated Apple products. AMD isn’t supporting pci 4 yet, and from what I last read from their release, it won’t be until 2020, unless that’s somehow changed. Their video cards are just now supporting pci 4.
intel isn’t expected to have support of pci 4 until end of 2019 with 10nm Cannon Lake. Pci 5 was fast tracked, so it’s out earlier than it otherwise would have been. But early 2019 for support? Hardly. I think the video cards will be built into the monitor, connected to the computer via Thunderbolt 3. Hardly need a bus at all. presuming the Mac Pro is as modular as the folks say it is. Nobody actually knows what "modular" means. For all we know Schiller just meant with a separate display, etc. When they first talked about it they didn’t explain how they were going to do it, but they did say that it would be upgradable so that it wouldn’t become obsolete (at least for several years, I would imagine). That, and the stated goal of productivity gains. That’s about it. They didn't say that either. You're sure projecting a lot into this Mac Pro thing. Are you even going to buy one? Um.... you need to search for Ryzen 3000 or Zen 2.
so, my question is, as always has been, why buy an un-pc(not sure what else to call it as mac owners aren't ever diverse. A "machine" that is way over qualified as far as adaptability, adding on components, (not a good area to overachieve at). The phones the pads the books are all the same, you buy something you have very little control over, you may think you do, but its only at a visual level, i.e. the content on your screen. And your limited at that, too. Most PC upgrading and repair can be done by people willing to take the time and read and follow instructions. With a Mac, if you keep that device for more than 2 or 3 years, you will be forced to buy a new one, not because its outdated, but because its forced into submission by Macintosh, demanding you buy more(slowing the device down, or not supporting it at all). I think most Mac owners just jumped on a wagon and bought theirs because everyone else is doing it. And then its like theyre die hard fanboys, who know nothing of what they're rooting against. They have no experince using PC's or Androids or any other variant but Macs. Its like paying, hell, over-paying for Communism...think about it!!! "128 gigabytes per second, and clock speeds up to 32 gigahertz"
So why is Apple still soldering its RAM and Storage modules to the mother board? ... This takes away the performance argument. Your son could probably use a lesson on the difference between value and cost. Apple doesn't always win on value, to be fair -- but it generally matches or exceeds everything else out there on TCO and useful lifespan. Wow, there's a lot wrong here. Lenovo's "Last Forever" -- and, if they do break or become obsolete, they can be repaired or upgraded. I just added an SSD to my 2012 T410. It runs like a champ! They did say that. It’s in the interview. Yes buddy, I am going to buy one. Are you?